Previously, on MinerBumping... An elite unit of New Order gankers converged on the Anyed system in Genesis. They detected a Hulk pilot illegally mining alongside an Orca alt. As they prepared to execute a terrific gank, the Hulk pilot set up an ambush by swapping out his exhumer for a Stratios. Our heroes arrived and promptly ganked the Stratios instead. The carebear's characters, dutchkiwi and Pureminer Pava, had been completely outfoxed by the New Order. Cynics might say that it's no big deal to outsmart a highsec carebear. However, when you consider the tens of thousands of carebears we've ganked, it's impressive that they've never been able to out-think us even once. The law of averages needs to be revised to account for the fact that the CODE always wins. Pureminer saw things in a completely different light. He believed he'd gotten the better of our Agents. After all, they'd originally intended to kill a Hulk, and they killed a Stratios instead. 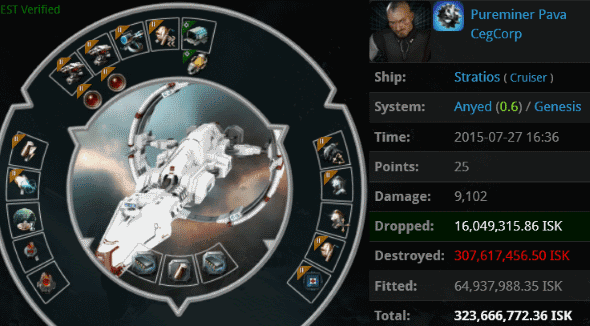 On the other hand, said Stratios was worth 323 million isk, and Hulks these days are averaging about 235 million. 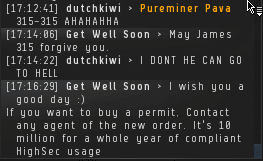 Pureminer lost around 90 million isk more than if he'd remained in the Hulk. Or he could've docked up or warped out and lost no ship at all. Miners don't make the best strategists, I've found. Agent Get Well Soon tried to reason with the carebear. But Pureminer fell victim to miner logic. The Stratios was "free". Pureminer's alt, dutchkiwi, poured out more invective. This was a sharp escalation in rhetoric: Usually miners tell New Order representatives to get cancer or AIDS, not all illnesses. Also, he wanted Get Well Soon to drop dead at the same time. I'm not sure how that would work, but maybe if you used a Phoenix Down on our Agent, he'd be revived but still have all the status ailments. The calm miner told our Agent that he hoped his country was consumed by terrorist attacks. This was a pretty reckless statement, especially since the miner hadn't yet confirmed that he and Get Well Soon didn't both live in the same country. Pureminer Pava, the very picture of tranquility and contentment, continued to rage in local. He must've really been missing his free ship. By this point, the carebear was boiling over with calmness. He imagined himself committing acts of desecration, grave robbing, and necrophilia. In-game, one supposes. In spite of everything, Get Well Soon remained professional. He earnestly hoped Pureminer would buy a permit. Isn't that something? He genuinely wished the miner well. Anyed local bore witness to the biggest contrast in highsec. The difference between Agent and rebel was laid bare for all to see. Is it any wonder that the forces of Order are gaining strength, while the rebels are shrinking into nothingness? It is no doubt at all that the Forces of the New Order are gaining strength over the forces of Mining, since two miners and two quarters don't add up to a dollar. Hello anon, let's talk about lies shall we? The New Order has been here for almost 3 years. There are constant, heartwarming, stories of lessons learned and taught throughout New Eden. Now those who learn the lessons always reply with such things as "Friends in Null Sec", "Didn't want that ship anyway", and my favorite lie "It was free for me". You should look long and hard (phrasing) at who is doing the lying good child. Perhaps you would want to have a talk about Jesus so you can spot the lies better? Hello anon, if the comments section can be used as a cross section of the Eve population, which I think it can, then the majority certainly is voting for James 315. So, like Jesus spoke so often, another truth. I find it very telling you don't specifically refute the lies spoken by the miners. rev,. you never fail to amuse. If you think that the same 3 or 4 CODE members replying over and over again, ether in name or anonymously, represent an accurate cross representation of EVE, well, then you must have an extremely low ability to separate truth from fiction. Given your self-proclaimed title, I suspect that this comes naturally to you. Let us just admire the ability and skill shown by CODE in uncovering so many ignorant, greedy, and emotionally immature people who are playing in EVE. You should have no problem with this, considering your background. Both Jesus and I have higher expectations from you; please don't let us both down,again. Well it seems we have a lot of work to do. Perhaps read your bible more and lie less. Lol.. this guy has trouble learning :(. He should have bought a permit. These kills never, ever stop being funny. Does that mean you will go gank with M ? Ming will never gank with me -=M=-, simply because he is to terrified of undocking. Besides he likely has it in mind that i would gank him (which i would not bother) as soon as he would fleet with me. Thats quite all right if he is scared, i just wish he would up and admit it. I am a New Order Agent, so that means that I gank with CODE. when I choose to gank. If -M- wishes to gank with me, He will have to join CODE. and the New Order, and buy a permit, as all members of CODE. do. He will then have to reveal his ingame identity, and the identities all of his (supposed) alts, as all members of CODE. are required to do. Then, and only then, shall he be granted clearance to gank with this character. Or he can always fleet up with me and go shoot wt flashies... :P ..but then, it would require being in CODE....so it goes back to what Ming stated..
Heya -M-anon, friend, can you link me your killboard please? Thanks friend, i would love to see all the ganks you are racking up. Ming said: I am a New Order Agent, so that means that I gank with CODE. when I choose to gank. When ming? Makes nearly a year and a month you have not undocked. You do not gank, you cower, in fear. As kaely would say, grow a pair. Im sure she has checked and found you still do not have any. You like to say "Show the proof". Where is the proof that you undock? hrm? P.S., if your short on funds, i will be happy to give you the ganking cats you need, if your brave enough to undock and join me that is. bunch of poisonous individuals playing a poisonous game you guys deserve each other. i never felt better since i left the bile that is eve online behind. Such bitterness... all over a game. Silly. And yet here you are... curious. Wow, if that's how he reacts about losing something free, I'm concerned with his mental health when he loses things that cost him some ISK! I'm sick of EvE! 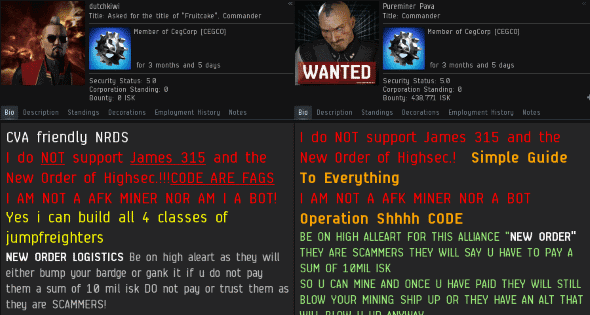 Highsec is too dangerous and full of sick sociopaths who like to PvP miners. I'm going to play Star Citizen. Now there is a sensible code monkey....but seriously, I bet you are off attempting another awox, eh? That -M-anon whiner has the best tears. So many he had to start whining as N-anon just to help with the overflow. Not enough isk in the universe to do that.